For people of all faiths and cultures to say together, in unison. Now that gender words like "man" are no longer standard for the plural of men and women, we substituted the words "humanity" and "our." This honors more inclusiveness of various spiritual traditions, and the feminist point of view. There is a unified spirit of invocation by using the word "our," rather than just individual, directly signifying the group invocative nature and potency of The Great Invocation. In presenting it to people of wide beliefs and cultural backgrounds, polarizing resistances to the united voicing of the prayer came from different connotations of such words as "men," "Christ," and "little" (in reference to human will). And for this updated version, the last line from the original 1945 Great Invocation is said three times, with a slight change in the final repetition to lend triple empowerment to the stanza and thus to emphasize the planetary focus. 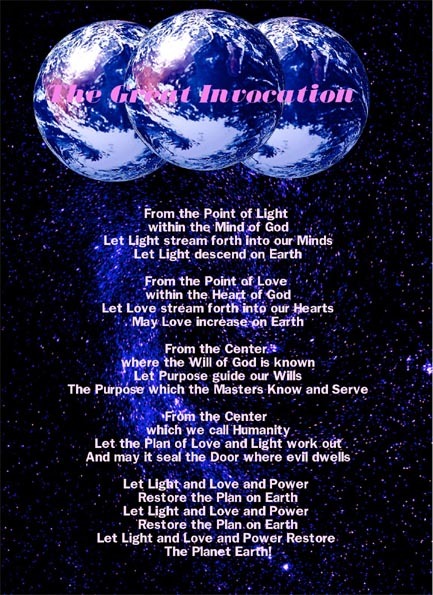 It is with these considerations that this version of The Great Invocation was revised by the creators of the SouledOut.org website. As a meditation group observing the major and lesser full moon festivals throughout the yearly cycles, because of our experiences in the larger world setting, we were impressed with a clear sensing that The Great Invocation needed to be updated, in order to share it in multicultural settings. The changes eventually made were evolved over 15 years, to the version presented here on the Internet. It has for this group of aspirants and servers stood the test of time since 1992. The Great Invocation was twice given out by Djwhal Khul by way of Alice Baileys writings prior to the rendition most people recognize. It was first introduced in 1936, prior to World War II, then an update came during the War in 1940, and the last update in 1945, just before the end of World War II. It has since been printed on millions of bookmarks and in the front of every Alice Bailey book published by Lucis Trust. While the energies leading up to World War II were building to their climax, the Inner Government of the world (D. K.s words) was working strenuously to confine the conflict between the Forces of Light and the Forces of Darkness to the mental plane, and to prevent its outbreak onto the physical. By 1936, however, it became apparent that the energies could not be contained on the plane of mind, and that the conflict would descend to the physical arena. And in 1936, the Tibetan, through telepathic communication with Alice A. Bailey, released the first stanza (the Tibetan's term) of The Great Invocation. Let men of goodwill everywhere meet in a spirit of cooperation. May forgiveness on the part of all men be the keynote of this time. Let power attend the effort of the Great Ones. In the midst of converging forces, strife and conflict, the keynote of Forgiveness was proclaimed ~ the need to unite, and to remember that the souls of human units are ONE. As the conflict escalated, the second stanza of The Great Invocation was released in 1940, and the Coming One was clearly and deliberately invoked. Let them bring succour to the sons of men. And coming, save. Come forth, O Mighty One. Let the souls of men awaken to the light. Let the fiat of the Lord go forth: The end of woe has come! At this time the world catastrophe was winding down and drawing to its close. The Charter of the United Nations was signed on June 26 (exactly one month after the Gemini full moon of 1945, on May 26) and enacted on October 24, 1945, with the 51 signatures representing all sections of the planet. An interesting sidelight to note is that Germany surrendered in World War II on May 7, right after the U.N. conference and the Wesak full moon, and Japan followed on September 9, a month after the bombings of Hiroshima and Nagasaki. This time in history yielded the climate of the world and of humanity in which the third stanza ~ which most usually think of as The Great Invocation ~ was released. And so it was that the "final" rendition of The Great Invocation, was given. The Tibetan asked his disciples to dwell on the phrase, "May Christ return to Earth." This return was not to be understood in its usual mystical Christian sense. What was referred to was the externalisation of what he termed the Hierarchy ~ that is, the senior disciples, initiates and Masters, in or out of incarnation, who are Custodians of the Plan for this world period. And by point of reference, the Tibetan had predicted the increasing externalization of the Hierarchy to begin its rollout in 1975. Many believe that this externalization is going forward continuously through those initiates, disciples and human units who seek to embody the principles and energies of the Plan and Purpose, and who seek to create the climate in which the further emergence can take place. The Great Invocation is a synthesis of meditation, prayer and affirmation. The term invocation means "calling down," "calling forth," "calling into." It is a request, a demand, an appeal to higher energies and intelligences. It involves all three: the mind, feeling and will natures. It is based on inner action, which is no less effective than outer action.